The clubhouse at Kalea Bay features three pools, including a resort pool, an adults-only pool and a children’s pool. Kalea Bay’s 88,000-square-foot main amenity area is located on the north side of the large lake at the community’s entrance. 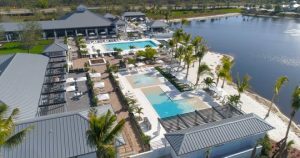 The 25,000-square-foot clubhouse features three individual pools, including a resort pool, an adults-only pool and a children’s pool, plus an expansive pool deck, an open-air bar, an indoor/outdoor restaurant, a fitness center, the café Bistro, a lakeside fire pit, kid’s game room and event lawn. If basking in the sun or taking a refreshing dip in the pool isn’t on a resident’s schedule, perhaps meeting friends for lunch, dinner or drinks is. The custom kitchens have Wolf and SubZero appliances, a natural gas range, luxury cabinetry, quartz countertops, a Butler’s pantry and oversized island, all standard features.